Used for determining the depth of color of plasticizers and also of solvents for paints and similar products. The Lovibond® AF325 is a special kit for visual color grading of Platinum-Cobalt/Hazen/APHA Color over the range 10 - 250 mg Pt/fl. It is typically used for light yellow liquids such as ground water, oils and chemicals. The color is determined by visually matching a column of sample in a Nessler cylinder with procalibrated colored glass standards, which are stable-colored and not affected by UV light or extreme environmental conditions. Because the sample colors are relatively unsaturated, the kit employs a long path length Nessleriser comparator to give greater measurement sensitivity and accuracy. The Lovibond® AF325 kit is supplied with the following equipment: Nessleriser 2150, Daylight 2000 lighting unit, AF306/P, Pt-Co/Hazen disc NSH, Pt-Co/Hazen disc NSB, and Nessleriser stand. 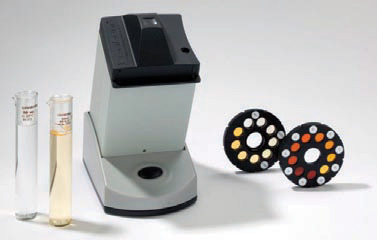 The Platinum-Cobalt/Hazen/APHA Color scale is applied to clear, light yellow liquids, defined by specified dilutions of a platinum-cobalt stock solution, ranging from 0 at the light end of the scale to 500 at the darkest. It is used extensively in the water industry but also for clear oils, chemicals and petrochemicals such as glycerine, plasticisers, solvents, carbon tetrachloride, and petroleum spirits. Lovibond® and Tintometer® are the registered trade marks of The Tintometer Ltd., Amesbury, UK.